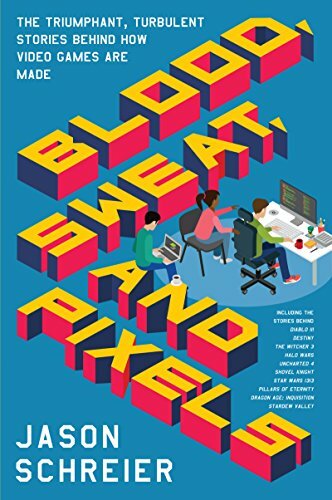 Looked and couldn't find a thread, but "Blood, Sweat and Pixels" by Kotaku's Jason Schreier is currently on deep sale on Kindle. It's $1.99 in both the US and Canada. I haven't read it yet, but I've heard it's a fantastic look into the harrowing world of game development. Note: if you don't own a Kindle, you can still read it on your phone/tablet via the Kindle app, or on a web browser via the Kindle cloud reader. Edit: also on sale on Google and iBooks! It's also available through Google Play Books. Luckily I checked before making the mistake of buying it through Amazon. Definitely recommend, especially the audiobook narrated by Noctis Ray Chase. Even the chapters on games I had no interest in were interesting to read/hear. If you have any Project Management experience the whole book is almost one big face palm. But it was a fantastic read. Shows up as $1.99 for me, which is still a hell of a deal. I loved this book and if you are interested at all in the process of game development and publishing, you will too. Bought! Been meaning to read this. Thank you for the heads up. Buy it! Try and get the audiobook if you can, its really good for car rides! I'm browsing from Canada, so I had to visit Amazon.com to get the US price. Maybe there's some weird auto-conversion going on. I double dipped from the printed copy! Will probably get the audio book, I want to hear about all the destiny 1 drama. Thanks for the tip! I'd had the sample sitting on my Kindle for ages. Just upgraded to the full version. I already owned the paperback, but what the hell. Bought for my Kindle. Already own the paperback, but bought. Will make reading on the train easier. Sigh, and yet another thing that I was going to put on my birthday list for my family is purchased by myself. Excellent book. Highly recommend to anyone interested in knowing about the backstage of videogames. Will see how easy it is to convert to Kobo format (otherwise I'll just read it on my phone). Had my eye on the paperback version for a while but this is a fraction of the cost. Already own the paperback and bumping this thread cuz the book is amazing. Y'all shoud pick this up! Absolutely fantastic book. Whoa, what a deal! Don't spend those royalties all in one place Jason. Yeah, comes up as $1.99 for me (US), but still bought! How much of this book is prose compared to images? Is it entry text based, or does it rely on graphics? This is really low but the book is so good it's worth a read. EDIT: Never mind it's just for US accounts. Huh. I'll double dip for sure! Great read, hope Jason writes another book soon. Been going through this as I've had a copy for a little while now, the chapter on Stardew is real good. Echoing that it's a great read, very enjoyable. Already own the paperback myself and I don't have a kindle, but great deal. I hope Jason writes a follow-up or another one, would be really interesting if he even covered some of the same teams/projects again, plenty of chapters are about long-standing service games. A truly fascinating read. Even game titles I had no interest in before reading turned out to have insightful and gripping development stories. I'm getting "This title is not available for purchase" in Canada? EDIT: Turns out I had the wrong region set in my Kindle settings. Thanks for the heads-up, looking forward to reading this! Honestly it's worth paying full price for. Love books like this. It's $1.99 for the Kindle version in the US. Quite happy to add this book to my wish list though! Seconded this. I really enjoyed the Stardrew Valley read even though I've no interest in the game. My buddy that is into the game had a fun time discussing it together. Not to be a shill, but Jason's authorship here was easy to pick up and hard to put down. Aaaaaaaand bought, completely forgot about the existence of this book. Thanks for the heads-up! Ray chase you say? He’s a great VA :D bought. So based on some responses, it's $1.99 in the US too (despite Amazon.com claiming otherwise when browsing from Canada.) I'll message a mod about editing the title then. I think I lent my paperback to a friend. So picked it up from this as I never got a chance to finish it. Thanks. For a couple bucks, bought. If you are at least a bit interested in video games (and I assume you are), just read it. It's absolutely phenomenal. It really makes you understand what these developers have to go thru to make these awesome games.